I have been making peace with my mom one little step at a time for many years. A while back though, I realized I have become stuck, vacillating between being angry at her and accepting her as she is. Frankly, I felt like I could not repeat this cycle anymore. I was simply sick of the energy it takes from me. I felt my guard go up at the word “repentance” because, while I’m certainly far from where I’d like to be in my life as a Believer, I truly didn’t know of anything I need to repent of when it comes to my relationship with my mother. Still, whenever my guard goes up that way, there is something deep within me that makes me want to run and hide and experience has proven these to be moments when God has something for me to learn. I found myself praying that night, “Okay God, let’s just get on with this. What do I need to know, to learn, to do?” He gave me the answer: forgiveness. “Again?” I whined back at Him. I wish I could simply study the concept for it to become absorbed into my personality. But forgiveness, I know now, is a process, and it is proving to be a long road. 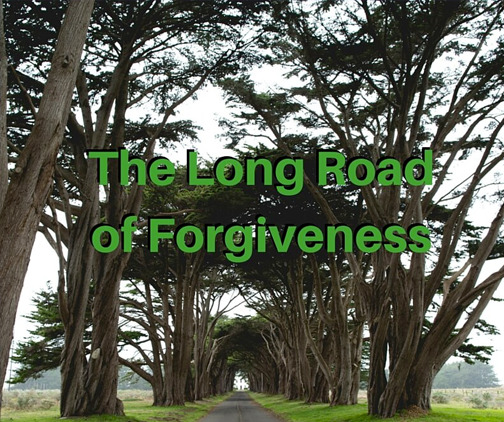 Over the next several months—holiday months, as it turned out—I walked on that winding road of forgiveness. At Thanksgiving, I opened myself to soaking in my extended family. Instead of focusing on protecting my own family from negative comments or possible disagreements over parenting styles, I sat and asked questions about my parents’ and siblings’ lives. I listened. I enjoyed my extended family. Over the Christmas holiday, my parents began arrangements to drive the four hours to visit my family and planned to stay three days. On the day they arrived, I cleared my calendar as much as possible so we’d have plenty of time to spend together. They arrived just as my sons were finishing kindergarten and preschool for the day. I wanted my mom to see that my older son had learned to read since she’d last seen him. Despite his ADHD and other special needs, he was proving to do well in school and was well-liked in his class. My younger son was writing his name now and had become much less shy around strangers. I was so proud of both my sons. Unfortunately, after only six hours with us, my parents left for their four hour drive home. I could see it coming. It became clear little by little in the short time they spent with us. As my son read his book aloud to Grandma, he grew distracted between pages–starting unrelated conversations with her or leaving the room to see what his brother was doing. As I used the techniques I’ve learned to regain his attention and focus, I saw her shut down, disapproval in her expression as she stared out the window into our back yard. When my son leaned heavily onto his grandfather’s arm to look at the dinosaur book Grandpa was reading to himself, I saw my father push him away with a gruff “move over!” When my son asked, “Grandpa, will you play with me?” I watched to see my dad’s reaction: my father stood up and walked outside, ignoring my son. By the time my daughters returned home from school and my husband from work, my parents were ready to eat a quick dinner and get on the road to the hotel. They told us that they decided to get home before lunch the next day and that it made more sense to get a hotel somewhere on the way home instead of nearby us. I was not surprised. I was, however, hurt. Again. My husband took the kids out for a while so I could have time for a private cry. As soon as the minivan left the driveway, I ran to our bathroom and knelt on the floor, sobbing explosively. Lord, why? This was their idea! They say they want to be with us and then when they are they can’t wait to get away. I hate this! I hate this! I hate this! Even during my crying I wondered exactly what it is that I hate. The best answer I could come up with: rejection. The next day, my mom called to tell me that they had made it home safely. Sensing some openness on her part, I commented on what a short visit they had for such a long drive and asked what I had been wanting to ask for a long time, “Don’t you…like…us?” After a pause, she assured me that they love us. “But I’ll be honest with you. Your son upsets me. He doesn’t need to act like that.” We had an honest but polite conversation about ADHD and how it presents itself in my son’s case; she affirmed their decision to keep their visits with us short at this point in their lives; and I thanked her for at least telling me how she felt. That night, I climbed into bed early, exhausted from rerunning the conversation in my mind throughout the day. Slipping way down under the covers and curling in a fetal position, I asked my Father, Why is this happening? I thought I forgave her. Why can’t she love us as we are? Why do I have to feel hurt all over again? I knew the answer immediately. Seventy times seven times I will need to forgive her. And in the process of this forgiveness that is ongoing and not the one-and-done that I imagined it would be, I will be healed. The healing, I realize now, will also be ongoing and not the one-and-done that I want it to be. Frankly, this was not the news I wanted. But it felt true to the depth of me. This is the type of forgiveness Jesus knew and did and taught. And while I am slower than I want to be in seeing His footprints, I know that it is only His footprints in which I want to walk. This kind of forgiveness, therefore, is what I want to know, to learn, to do. And I must continue walking that long and winding road with Jesus beside me. I can relate to how it feels to be rejected over and over again. I just had this happen recently and my reaction was similar to yours. “Why, why, why?” I asked the Lord. I must continue to forgive seventy x seven. It would be nice if it could be easier but it is not. Oh to be human!